The appearance of their lawn is something that many homeowners spend lots of time focusing on. Fertilizing, mowing and regular lawn maintenance is obviously important for stimulating growth and ensuring a lush, green lawn. Unfortunately, nothing can undo all of your hard work like those extreme summer temperatures. The biggest key to keeping your lawn looking great throughout the summer is to ensure it stays well hydrated. However, simply running your sprinklers occasionally isn’t enough, as it is important that you know how and when to water. In addition, you’ll also want to make sure you’re properly informed about the various other measures that you can use to slow down evaporation to ensure your grass gets all the water it needs to beat the heat and stay healthy. All plants require regular watering to stay healthy and grow strong, and your lawn is no different. However, watering too much can also cause a number of potential problems. A water-logged lawn creates the perfect conditions for damaging fungal infections and too much water can even end up killing off your grass by causing the roots to rot. Therefore, it is essential that you pay attention to the weather and temperature in order to determine how often your lawn needs watered. In the middle of the season when the temperatures approach the 90s or 100s every day, you’ll most likely need to water once a day. Still, the easiest way to tell when your lawn needs watered is to stick your finger down into the soil. The lawn should be watered any time that the soil is dry more than an inch or two down. One of the keys to keeping your lawn properly hydrated is to water during the early morning when the temperatures are lower. Watering in the middle of the day is generally a waste as the vast majority of the water will evaporate before the roots can take it up. The lower temperatures in the morning will allow the water to soak into the soil deeper and ensure that the roots can take up all they need. Although some people recommend watering in the evening, the problem with this is that the grass and soil could stay wet for too long. Some evaporation is obviously necessary to keep the roots from being water-logged and to help prevent fungal infections. 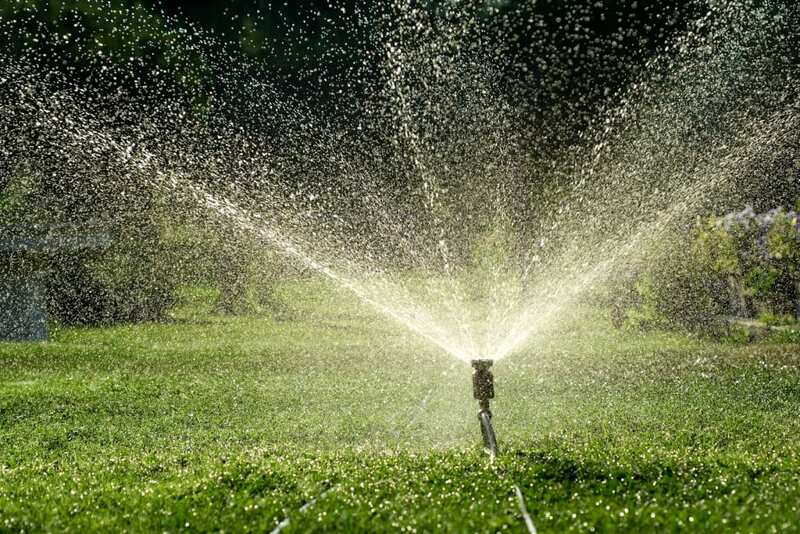 For this reason, it is highly recommended that you water in the early morning as the rising temperatures will allow any excess water to evaporate before it potentially damages your yard. Heavy foot traffic can eventually cause your soil to become compacted, in which case it becomes much more difficult for water to penetrate into the soil and reach the roots. Regularly aerating your lawn is the easiest way to help solve soil compaction problems and ensure that the roots receive the nutrients, oxygen and water they need. In the middle of the summer when the temperatures start to become extremely hot, even watering early in the morning isn’t always enough to slow down the rate of evaporation to ensure that the roots receive all the water they need. This is why many experts recommend laying down a thin layer of mulch, compost or other organic material. By doing so, you can help further slow down the rate of evaporation and ensure that your yard stays fully hydrated. Lawn care and maintenance is something that we all have to deal with. That is, unless you’re ok with having a dead, brown lawn. Although your maintenance routine will obviously include many different tasks, the most important thing you can do is to ensure that your lawn stays well hydrated. By taking a bit of time to water properly and prepare your soil, you should be able to ensure your lawn looks great from spring to fall.